Heather joined the GAH crew in August 2015. After spending several years working in physical therapy for our four-legged friends in Ohio, Heather and her husband, John, moved to Minnesota to be closer to family in La Crosse, Wisconsin. 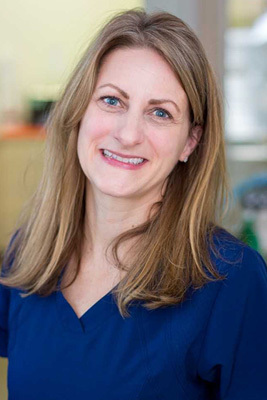 She loves being able to be more hands-on with her patients in day practice and enjoys getting to work more closely with her peers. Heather and John have FIVE dogs; George, Lucy, Norma, Walter and Stan. In her free time, Heather enjoys going to rock concerts, road trips, art museums and reading a wide variety of genres. Oh, and she's a HUGE Packers fan.... We'll let it slide. Suzy has worked at Gehrmans since 2009. She lives in Plymouth with her husband, 3 kids, her rottweiler Rue and cat named Kitten. She enjoys assisting in surgery and keeping the in house lab equipment running smoothly. Outside of work she keeps busy watching all her kids sporting events, baking, reading and being outside when it is warm. Jim has been a familiar face at Gehrman Animal Hospital for many years. He is our Senior CVT and provides mentoring and coaching to all of our tech team. Jim says the best thing about being a technician is providing health care to companion pets. Jim has 3 adult children and 6 grandchildren Outside of work, his hobbies include fishing, hiking, biking, traveling, and coaching. Bubba, Jim's devoted Bichon Frise, frequently accompanies him to work! Bubba now has 4 cousins Bruce, Milo, Murdock, and Nellie, all too playful for him. 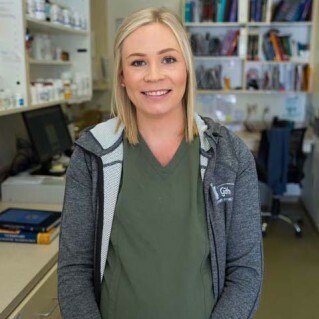 Emma joined our team as a Veterinary Technician in September, 2017. She transferred to us from a small animal hospital in Woodbury, MN where she was for the last 4 years. She is newly engaged, and is set to get married in May, 2018! She now lives with her fiancé and their 2 cats Polly and George in Hopkins, and hopes to add a canine friend to the mix very soon. She loves assisting in surgery, and performing lab work, and in her spare time enjoys going to her cabin, spending time with friends and family, and being active outdoors! She can't wait to meet you and help care for your animal companions. Katie grew up in Plymouth with a variety of pocket pets and always knew she wanted to work with animals for her career, which made her decision to go tech school a perfect fit for her. Katie received her degree from Argosy University in January of 2018 and joined the Gehrman team this last May. 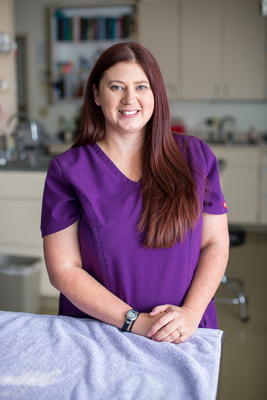 Katie’s special interest in the veterinary field is dentistry and surgery. In her free time she enjoys horseback riding, camping, sand volleyball, and spending time with friends and family. 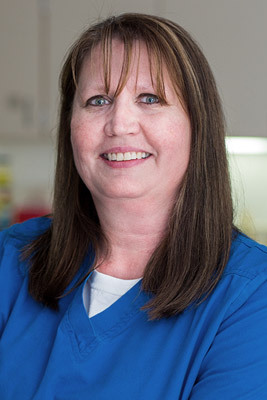 Kathy has been a CVT since 1991 with most of those years spent at Gehrman Animal Hospital. She has really enjoyed getting to know the clients and meeting their furry family members. She enjoys helping in surgery and has a special interest in dentistry. She has additional training in pet nutrition and weight management and is a certified weight coach. She would be happy to help any pets in need to develop a weight loss plan. Kathy lives in Maple Plain with her husband and 2 sons. She loves hanging out with them especially outside in the yard, by the campfire or in the boat. 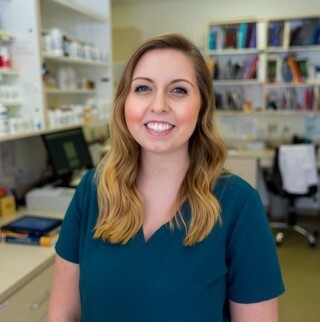 Lexi joined Gehrman Animal Hospital in November of 2018. Prior to joining our team, she worked as a Veterinary Technician at an animal hospital in Bloomington for a year and a half. She also spent two years working at a humane society while attending school. Lexi graduated in 2017 from Argosy University, where she earned her AAS degree. She grew up in Delano with a variety of pets, and always knew that she wanted to work with animals. Lexi currently has a holland lop rabbit named Koda, as well as two rescue cats, Kala and Aurora. Lexi has a special interest in surgery and dentistry. In her free time she enjoys going to concerts, traveling, being on the lake, and spending time with friends and family.